After our swim at the Pollok Beach rock pool the kidz did what kids do best on the beach. Build a sand castle. 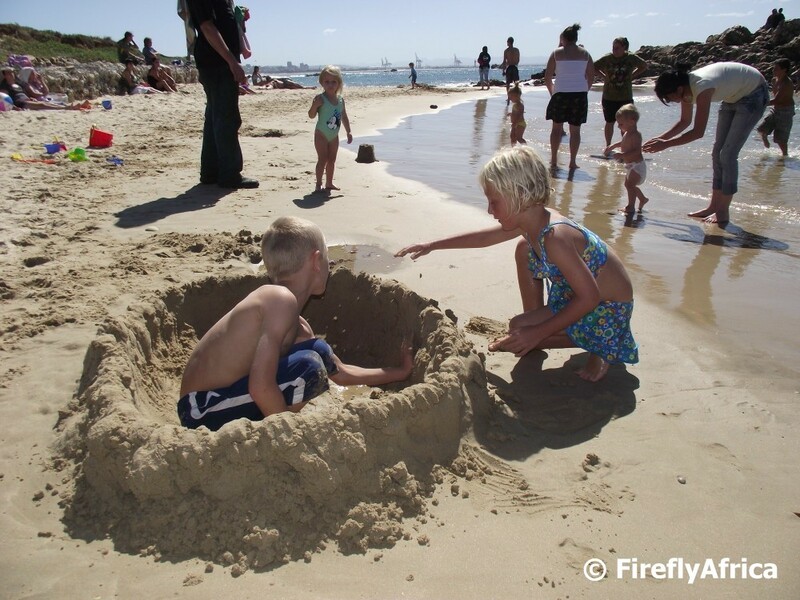 This coming weekend looks like its going to be a cool and wet one so no sand castle building on the cards. 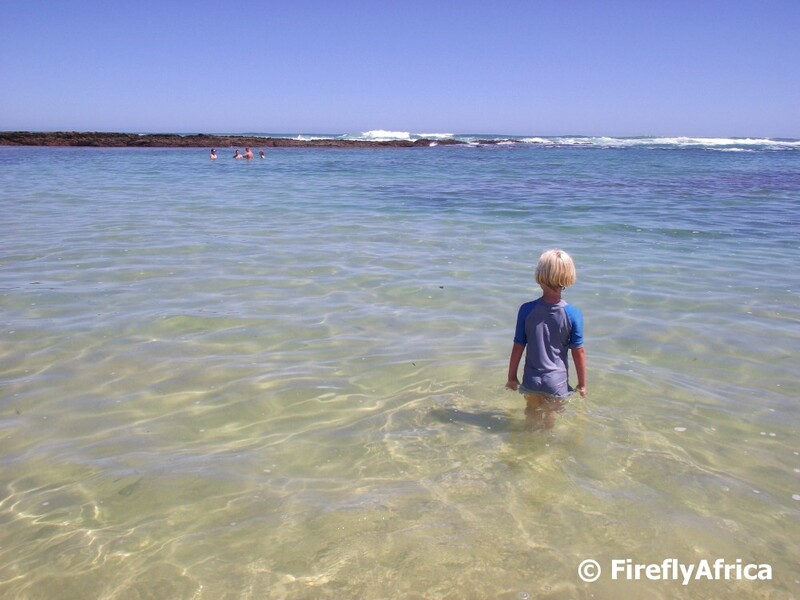 One of my favorite places as a child was the rock pool below the old Something Good roadhouse next to Pollok Beach. At high tide the waves wash down the cannel, through the gap between the rocks and over the wall. 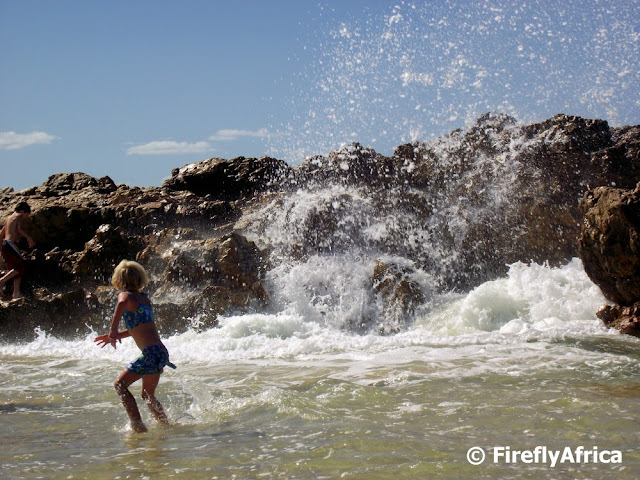 Last Sunday we took the kidz down on a gloriously warm autumn afternoon and I relived the good old days by bobbing about in the pool and dodging the waves coming over. The kidz didn't venture in very deep but on this one occasion Drama Princess didn't see the wave coming and I caught her on camera just as she started to make a hasty retreat. The Nelson Mandela Metropolitan Art Museum consist of two buildings flanking the main entrance into St Georges Park. 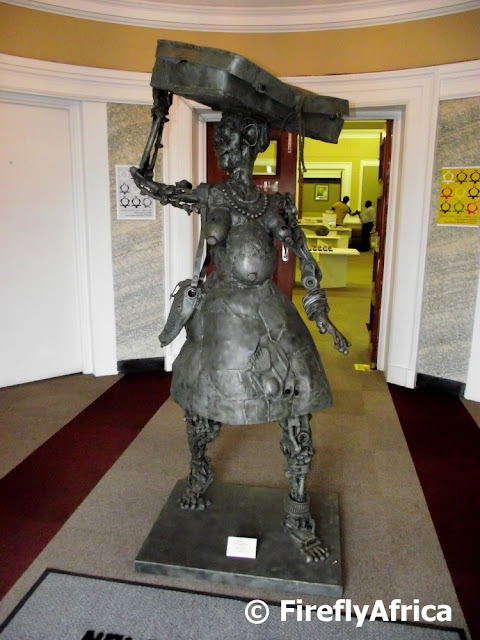 In the foyer of the right hand building the figure of Thobeka welcomes visitors to the gallery. 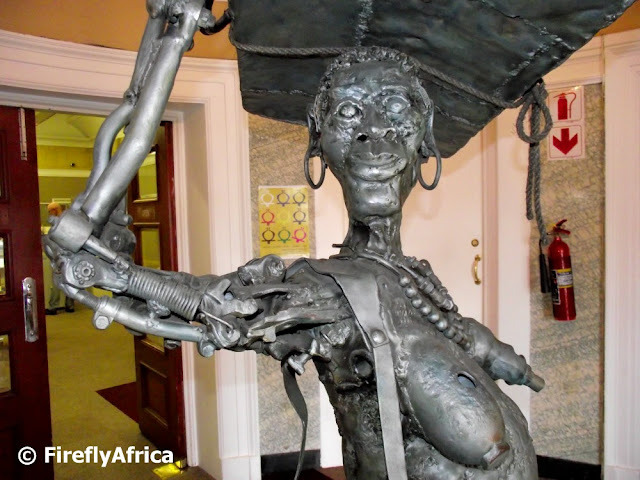 Thobeka is a work of art by artist Willie Bester and consist of welded recycled metal. She was purchased by the museum in 2002 and has been on permanent display in the foyer. 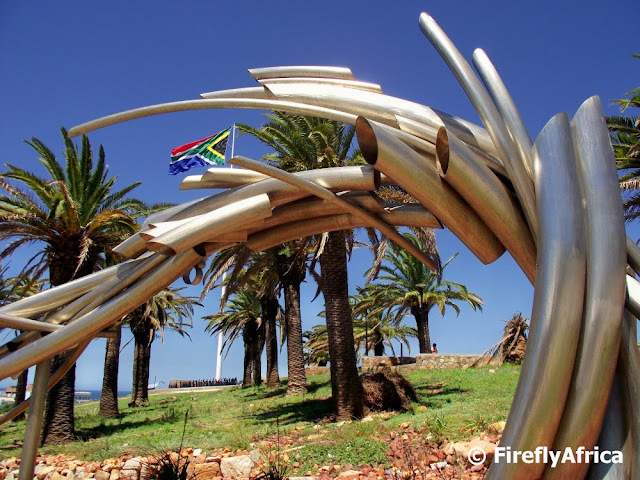 A different view of the giant South African flag on the Donkin Reserve. This time seen through the Donkin River memorial piece. 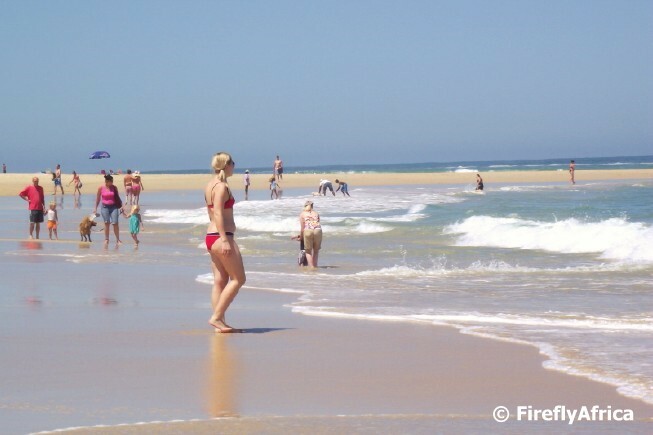 Summer may be packing her bags to head up north but the days are still nice and warm and people are still going to beach for a swim. 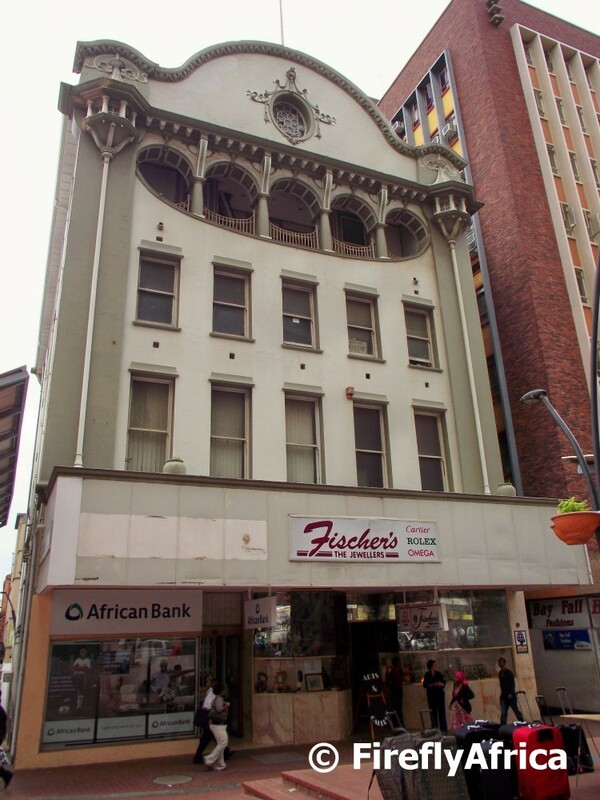 The old Fisher's building in the Port Elizabeth city centre may have close links to Fischer's Jewellers in the city, but isn't used as a jewellery shop anymore. 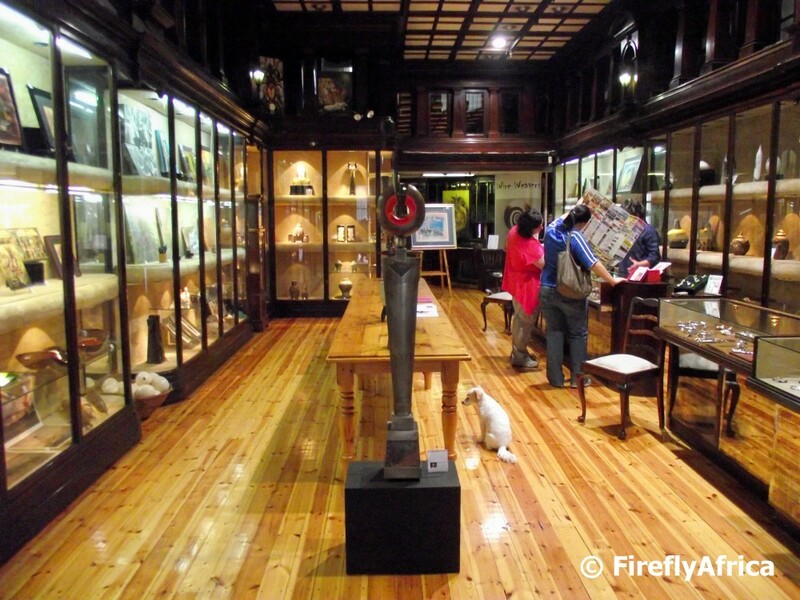 The old jewellery showroom has been revamped by the owners and is used as a gallery and shop for art, ceramics and glass ware. Fischer's Jewellers in Port Elizabeth are one of those businesses that has been around for just about forever. In 1858 Edward Preiss from London advertised in the "Eastern Province Herald" that he has taken premises next door to the newspaper's office in Main Street and started business as a watchmaker and jeweller. 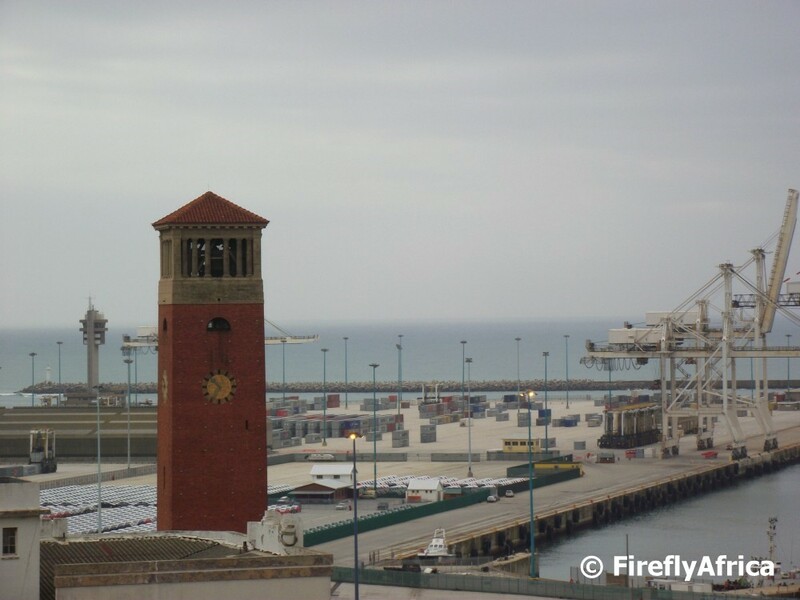 In 1859 Alwin Fischer and his brother Theodore, both watchmakers, came to the Cape Colony from Saxony. Theodore opened a business in Cradock while Alwin came to Port Elizabeth and started to work for Preiss as his assistant. In 1861 Preiss' shop moved "six doors higher up where a clock hangs over the window". Preiss announced his retirement four years later and Fischer took over the running of the business. Fischer retired in 1891 but the new owner kept the name "Fischer's". The old building was demolished in 1910 with the current building completed the next year. With only a few buildings constructed around Port Elizabeth in the Art Nouveau style, the old Fischer's building in the city centre must be one of the best examples still standing. The residents of Nelson Mandela Bay is very fortunate to have a place like the Groendal Wilderness Area right outside our "back door". (Hopefully I don't insult any of Uitenhage's residents by saying it that way) The 30 000 hectare Groendal Wilderness Area protects the water catchment area of the Swartkops River with the Groendal Dam in its centre. All of this falls within the Groot Winterhoek Mountain range and these days form part of the Greater Baviaanskloof Wilderness area. 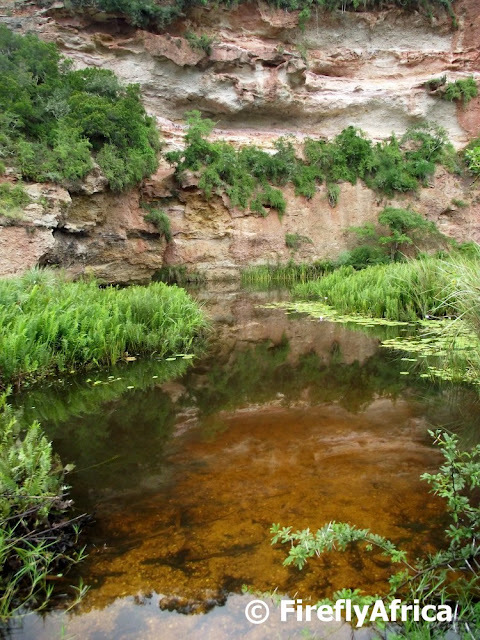 Groendal's rugged terrain is incised by numerous streams and ravines with the vegetation being predominantly fynbos. There are also isolated pockets of indigenous forest occurring in the ravines as well as elements of Subtropical Thicket (Valley Bushveld). Today is Human Rights Day in South Africa. A day for us to remember all the wrongs of the past and to celebrate setting it on the right course into the future. Note how I'm not just saying setting it right as this country still has a very long way to go before it will be right. At least we are heading in the right direction. But as we celebrate Human Rights Day we also shouldn't forget the animals. I'm not going to go into abused pets and where not to buy them, but rather touch on wild animals. The rhinos in this country are being slaughtered at a rate of dozens for their horns which are in high demand in the Far East because the people there think that the rhino horn in powder form will amongst others help them with their "horns". Just the other day I saw an article saying that the rhino may be no more by 2015 if things go the way they are at the moment. 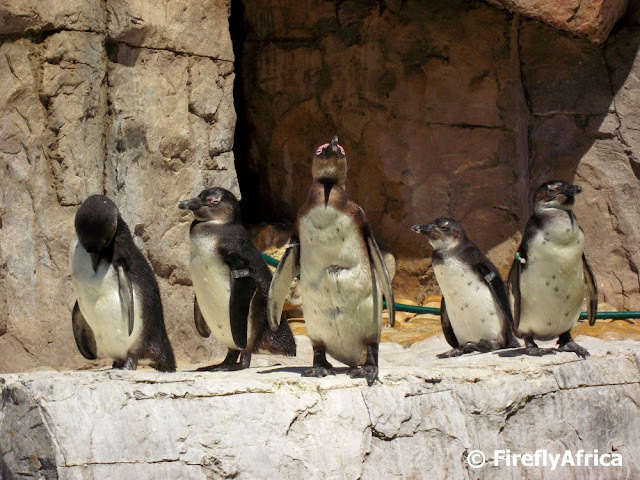 The African penguin is also in serious trouble. 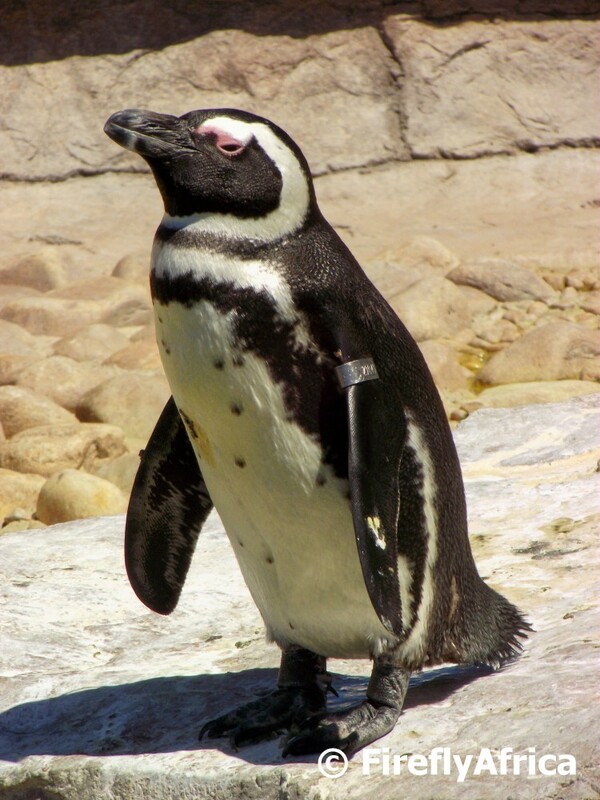 Not because they are being hunted, but due to global warming, pollution and the over fishing of our oceans the African Penguin may also be extinct withing 5 years. Luckily we have places like the South African Marine Rehabilitation and Education Centre (SAMREC) right here in Port Elizabeth fighting hard for them. One of the new art pieces that has been installed on Route 67 is a freeze by artist Mpumzeni Ezra Gwazela. The freeze represents the proud history of creativity in Nelson Mandela Bay and the Eastern Cape and is located just outside the entrance of the Campanile which is also the start of Route 67. 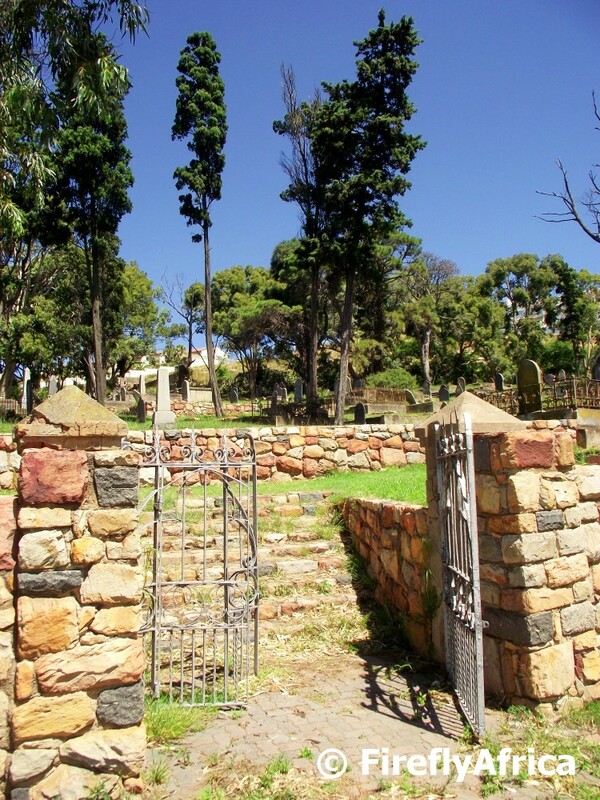 The entrance into the historic St Mary's Cemetery at the bottom of Valley Road. I love wandering through St Mary's and discovering all the old graves, some belonging to original 1820 British Settlers. In the township it isn't necessary for a eatery to have menus to hand out to patron. This take away joint has their menu painted on the outside wall to attract clients. 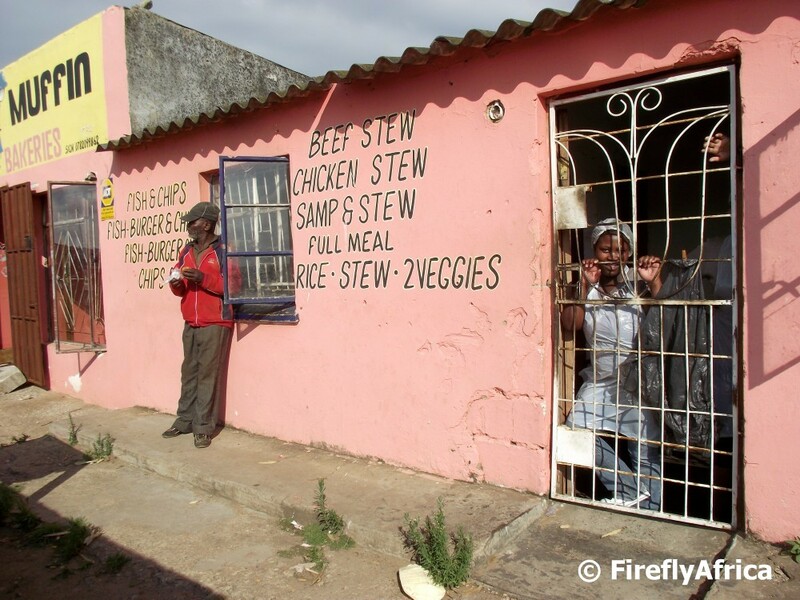 Orders are put through the window in the middle and I assume the lady hanging on the gate will then prepare your meal for you to take away. Or eat just there leaning on the window sill like the guy in the middle of the pic. 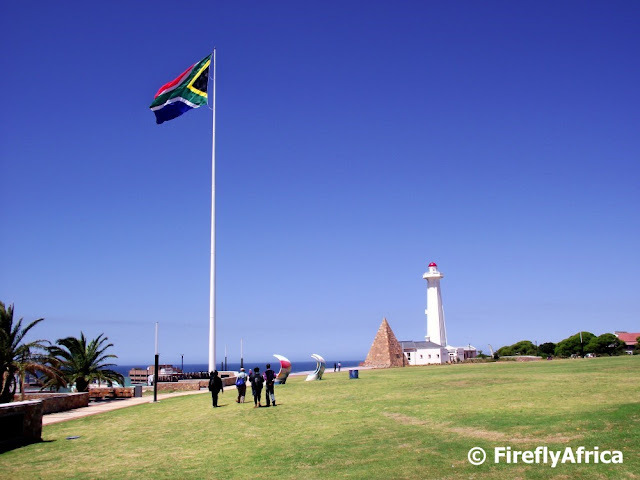 A beautiful blue sky day (not taken today though looking out the window at the overcast Friday sky) on the Donkin Reserve with the Donkin Lighthouse and Pyramid on the right and the highest flagpole in South Africa on the left. 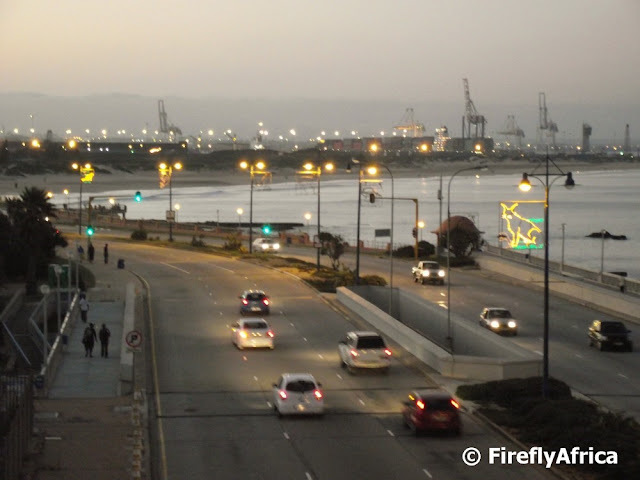 Looking towards the Port Elizabeth harbour from the top a building in the city centre the Campanile is visible in the foreground. 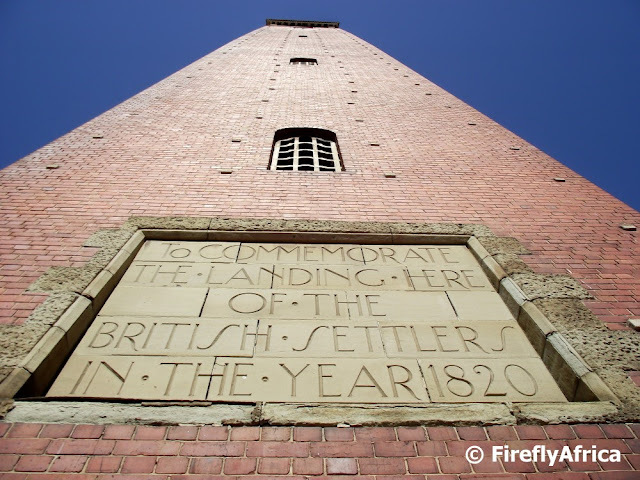 The little half moon window just above the clock is the viewing deck which is reached by climbing the tower's 204 steps. Above that just behind the pillars are the Campanile's carillon of 23 bells, largest carillon in South Africa. 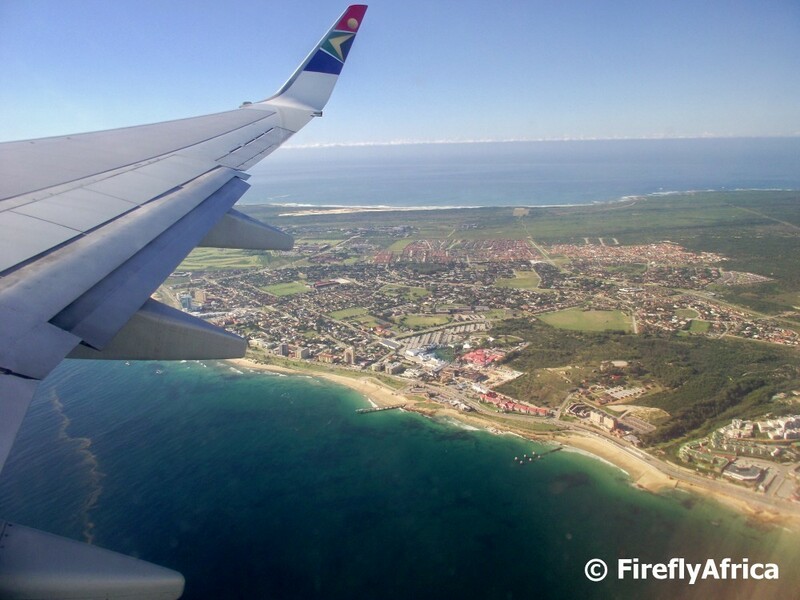 Do you ever wish you could fly through the air like Superman (or any of the other superheroes from your favourite movie or comic book - or graphic novel like some of the purists would call it. I may be afraid of heights, but I often do. Whenever I get the chance to fly somewhere (by plane that is) and look down on Port Elizabeth either leaving or returning, I wish I could get the opportunity to fly along the metro's coastline and over its landmarks at a slightly lower level to take pictures of it. I received tickets to go and watch the Warriors, our local cricket franchise, play the Knights in a Pro20 game on Friday night. 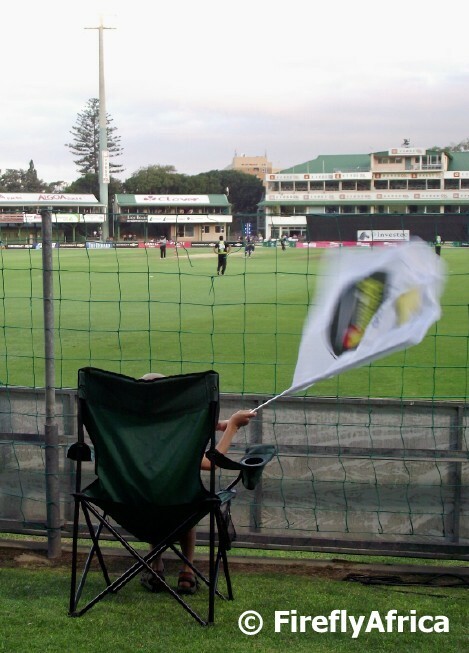 I've only taken the family along to a cricket match once before a couple of years ago and decided to do so again. We sat on the grass banks below the Duckpond Pavilion and Chaos Boy pulled his chair right up to the barriers flying his Warriors flag. A couple of us at work have started to pop out once a week to visit some of the tourist and historic (which is also tourist) attractions around town to familiarise and keep ourselves up to date with the places tourists would go to. The places we selected for last week's visit presented us with a lot of stained glass both historic as well as much more recent. 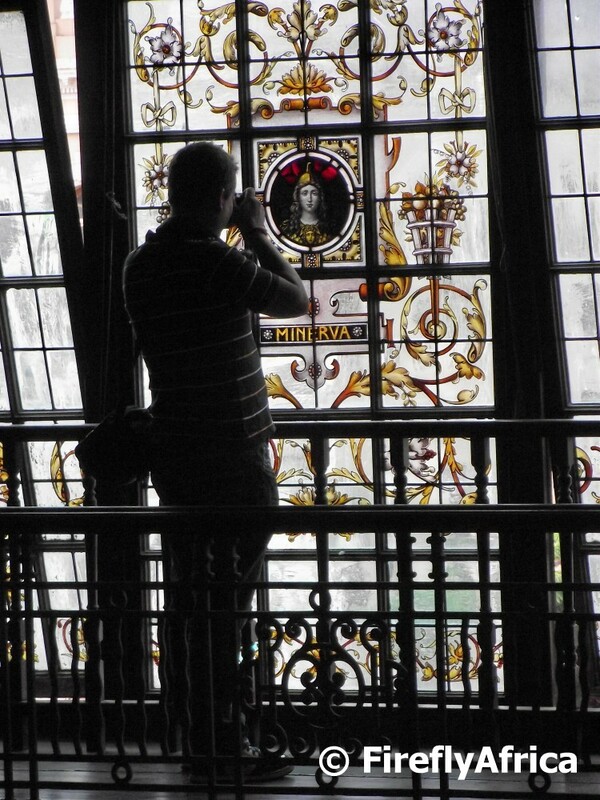 Here I caught one of my colleagues photographing a stained glass window in the historic Public Library. The art project currently on display at the Athenaeum building in Central is a project called Conversations with Victoria. 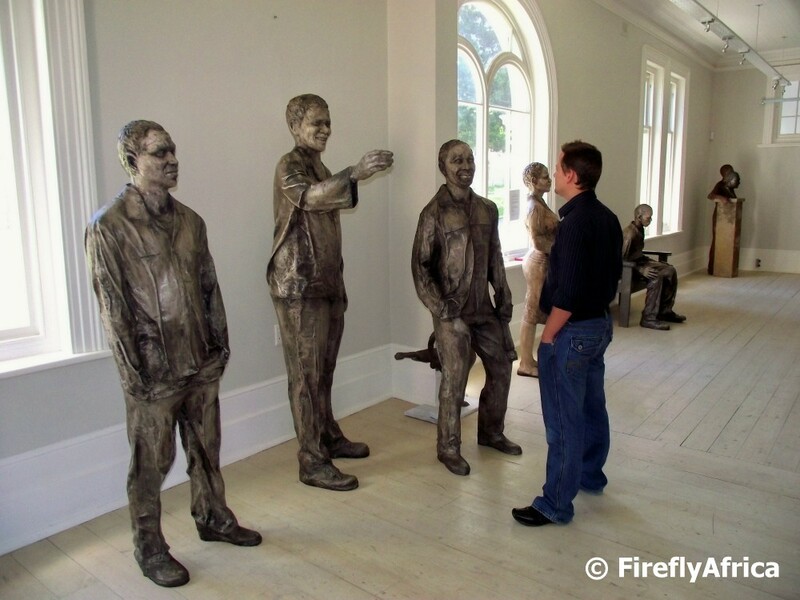 Once the project has been implemented it will consist of a number of life-size figures of both political figures as well as ordinary people placed around the statue of Queen Victoria in front of the Public Library in the city centre. It will seem as if they are in discussion with the Queen regarding the past, present and future. Perhaps a little bit of sport, fashion and general gossip as well. 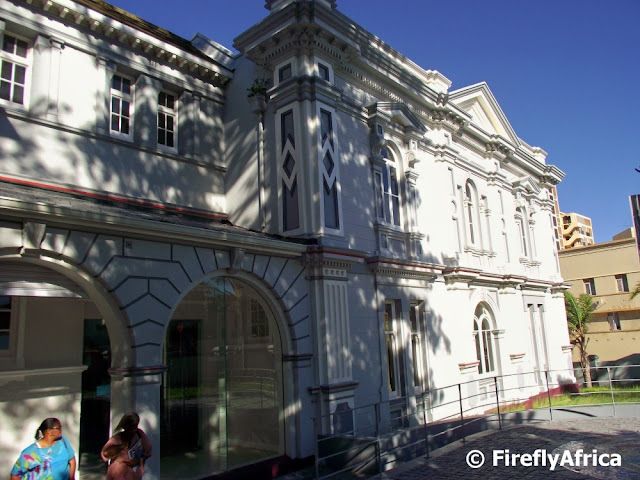 The Athenaeum in Port Elizabeth was founded in the 1850′s to promote cultural activities but sadly died out in the 1880′s. In 1893 the Young Men’s Institute, the School of Art, the Naturalists’ Society and the Camera Club came together and re-assert the right of the Athenaeum to occupy a part of the City Hall. The then Town Council offered to bear most of the cost to erect the present building which was opened in 1896. In the early years of the 1900′s it became mainly a social club and changed its name, but it has since again become a centre for cultural as well as social activities. After the Second World War the Port Elizabeth Musical and Dramatic Society rented and enlarged the Loubser Hall extension which is now the Ford Little Theatre. The building, declared a national monument in 1980, is one of only a few examples of the classical style of architecture in the city and was designed by George William Smith. 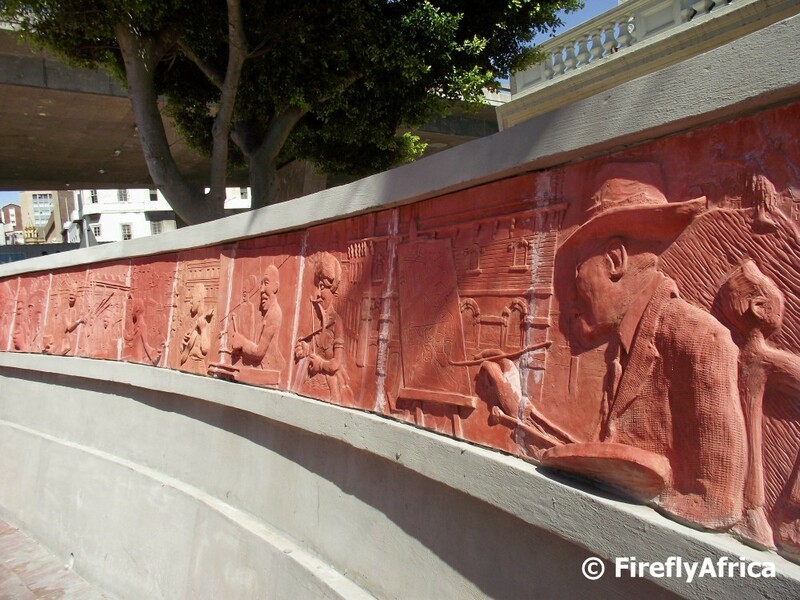 The Mandela Bay Development Agency as part of the rejuvenation of Central and the development of the Route 67 art route has restored the building and it was officially reopened in 2011. This is the last post in this short series featuring the UDDI's Despatch Eco-Hub. Part of their vegetable garden project is a very innovative hanging tomato garden. The tomato seeds were first planted together before its going to be replanted into cut off plastic two liters cold drink bottles. These containers will then be hung on the fence with wire creating a tomato "hedge". Very good idea if you are short of space. 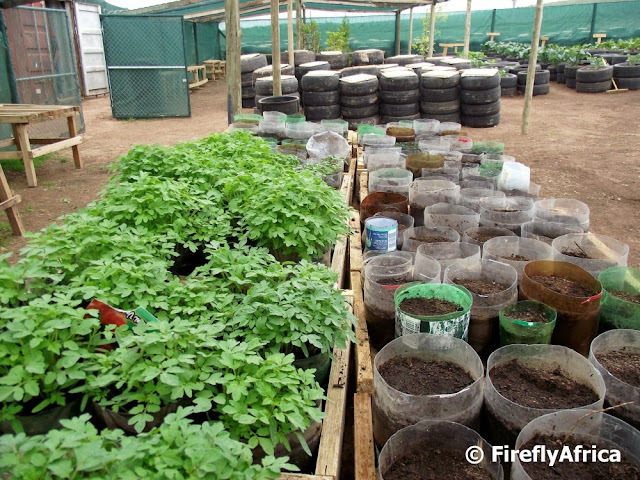 One of the main projects at the UDDI's Despatch Eco-Hub is a very innovative tyre garden. 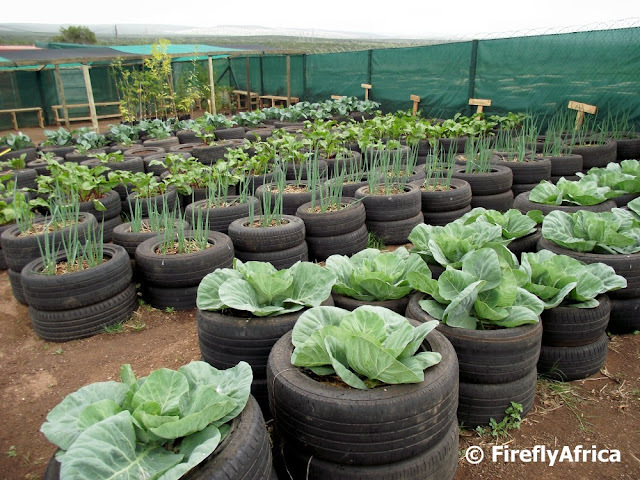 Two tyres are fixed onto of each other, filled with soil and veggies planted in them. It a great way to recycle tyres as well as establish a veggie garden where the soil may be of bad quality or there may not be enough space for a garden. They can quite easily be moved around as well. The other thing tyres are used for at the Eco Hub is the making of compost. Three tyres are fixed together and closed up at the bottom with a piece of wood. The tyres are then filled with grass cuttings and other plant and left over food material, closed up with a lid and left to decompose. The Uitenhage Despatch Development Initiative (UDDI) recently established their first Eco-Hub as a pilot project in the Despatch township of Khayamnandi. 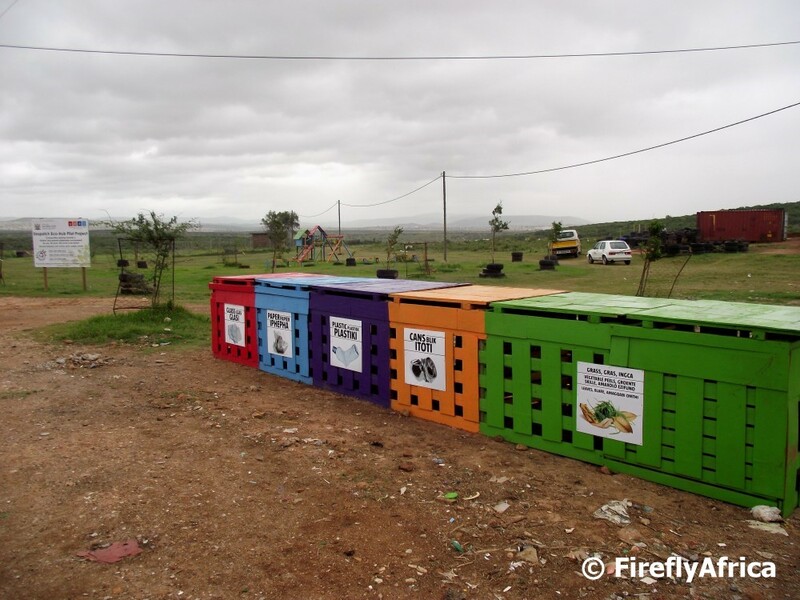 The project is about "transforming hot spots into green spots" and involves the empowerment of members from the local community to do something for themselves, their community as well as the environment. One of the components of the project is a recycle station where residents can separate glass, paper, plastic and cans with a fifth bin for grass cuttings that are used in the making of compost. 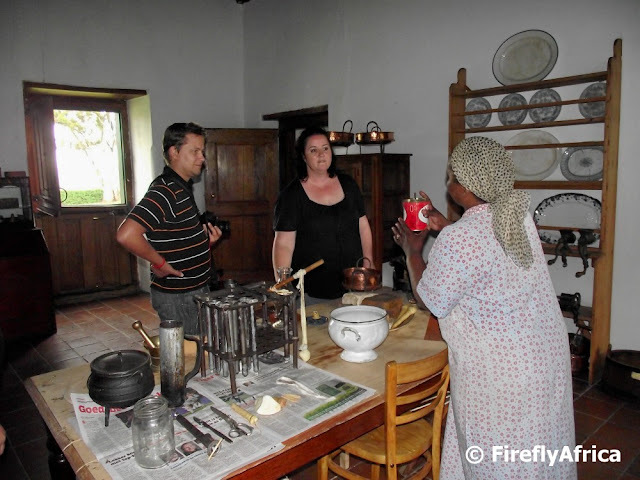 Visiting Cuyler Manor Museum in Uitenhage with a couple of colleagues last week, we had an opportunity to be shown around the museum grounds and the old manor house by a very enthusiastic Rosie. Rosie has been working for the museum for years and even though she isn't a trained guide she could just as well have been. She told us all the stories regarding specific things around the farm yard, but once we got into the manor house she was really in her element. In the picture she is demonstrating some of the things that were done in the kitchen, amongst others candle making. The town of Uitenhage was founded on 25 April 1804 by General Jacob Glen Cuyler who also acted as Landdrost (district magistrate) of Uitenhage from 1806 to 1827. Cuyler bought the farm on which Cuyler Manor was built in 1814 and and lived there until his death in 1854. 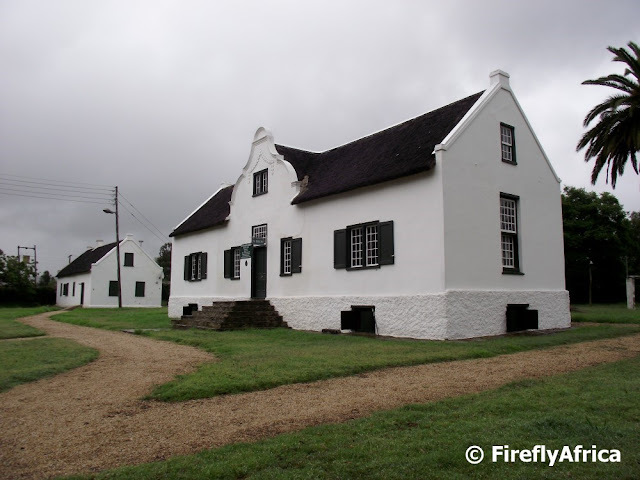 The Cape Dutch style house has been restored, furnished in the style of its day and along with the surrounding farm yard forms part of the Cuyler Manor Museum. After a hot January, summer took a bit of a back seat during February. The last week or so it's been back with force and we could get back in the pool again. Last Sunday we headed down to Sardinia Bay for a walk with the dogs and Drama Princess couldn't resist trying out the calm waters of one of the little bays. The Damselfly started running a couple of months ago and I have now been drawn into the picture. The plan was for her and her running partner to go and do the Knysna Forest Half Marathon in July and unfortunately her partner had to pull out because she is unable to go. That is where I come in. Kinda voluntarily forced. So I'm slowly putting in more effort in the gym and started doing the 5km fun runs on Saturday mornings to get myself used to road running again (while getting fit and trying to get into some kind of shape that resembles the other runners on the road). 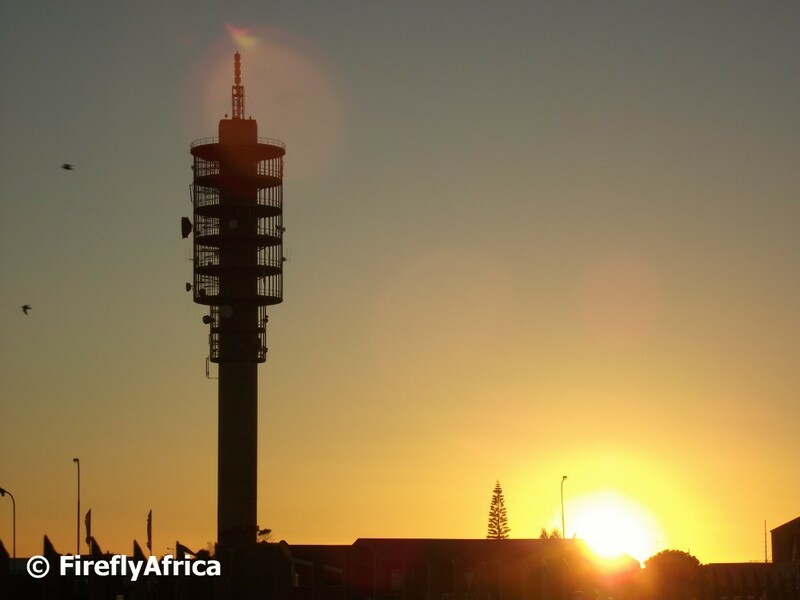 Anyway, this picture was taken a couple of weeks ago of the sun rising next to the Telkom Tower in Linton Grange. Minutes later I set off on my first 5km of the year. I'm a qualified scuba diver but I haven't "blown bubbles" as they say for probably 10 years. 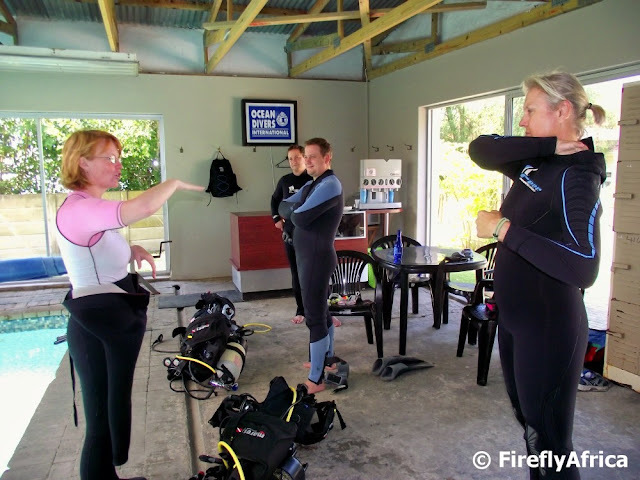 So I was very excited when Ocean Divers International (ODI) invited a couple of us from the office for an educational. Two of us had dived before while the other four were all virgin divers. It was such an amazing experience getting back in the pool with the full kit on again and brushing up on the skills. The next day we headed out to sea and unfortunately the conditions weren't ideal (I can tell you about the baritone Louw brothers but I will spare them - and them - that), but it was exhilarating to be under water again. We really are fortunate here in Port Elizabeth. 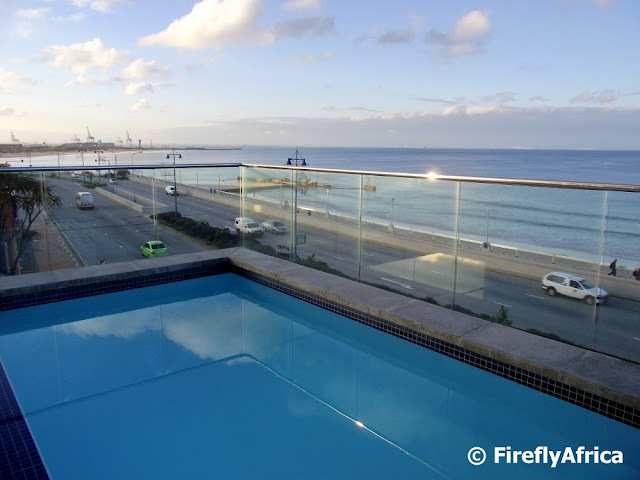 Our coastline both inside Algoa Bay as well as on the Wildside has the most beautiful reefs, colourful soft coral and is teeming with life with everything from small fish to ragged tooth sharks.